A Thing Called Hope: How being a bridesmaid helped my struggle with infertility. How being a bridesmaid helped my struggle with infertility. In the summer of 2010, Jamie and I left the Center for Reproductive Medicine after signing a contract for the Attain IVF plan and writing our a big, fat check. 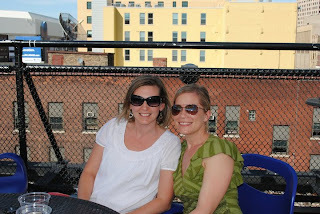 I headed to a nice rooftop bar to have a drink with my good (and beautiful) friend, Ann. She showed me her incredible, gorgeous engagement ring and shared wedding plans and ideas with me (after, of course, listening to me recount every detail of our meeting at the IVF clinic). We were drinking delicious mojitos, but that's beside the point. I knew Ann and Jordi were planning a small wedding, so I was very pleasantly shocked and honored to be asked to be a bridesmaid in the wedding. At the time they were planning to be married in Spain, so I sent Jamie a text telling him we were jetting off to Spain next summer/fall....he assured me that we'd make it work! I had visions of me attending their wedding with baby in tote, or at the very least, a big baby belly. I think you all know how that turned out. Our year was tough, painful and full of loss and disappointment. After a year of doing everything we could to grow our family and failing miserably, I hardly felt like myself. I felt defeated and washed up. Ann and Jordi's wedding plans were underway, and it was a joy to be part of it, something bigger than ourselves--to see their love for each other and their excitement to continue their life together as husband and wife was truly inspirational. It was so refreshing to see dreams come true. I'm a believer in happily ever after, and even though it felt like our happily ever after was on hold, it was SO good to see it come alive for one of my dearest friends. I bought a dress for the wedding in February, about a month after we had our 3rd miscarriage (all of the bridesmaids could pick out our own dresses in any shade of purple--I LOVED that!). It was kinda tight. I gained 10 pounds during our IVF process and the miscarriages that followed, so I figured I'd soon lose the weight. We went to a fun family shower for Ann and Jordi. A little over a month before the shower I found out I was just over 5 weeks pregnant. I planned to tell Ann when we were trying on our dresses that I'd be getting a maternity dress instead. But, I miscarried shortly before the shower. I tried on the dress I bought in February that I now planned to wear again....it was still tight. Ann and Jordi made a wedding website. Ann wrote about each of her bridesmaids, I read her description of everyone and read mine last. I cried happy tears, her words were so sweet, I couldn't believe the person she was writing about was me! She put so much heart into writing about each of her family members and friends, and I know it wasn't just for her, it was for us. Ann reminded me of who I truly was, not the infertile, washed up failure I felt like. 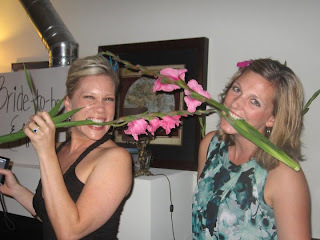 We had a bachelorette party. We hung out just like good old times. I felt like myself. For those of you that don't know, I'm kinda an entertainer at heart. But, the dress was still tight. By example, Ann and her sister, Kris, inspired me to take better care of myself. 5 weeks later, I tried on my dress thinking it would fit perfectly and it was too big. After a slight freak out session, I called a friend and co-worker who saved the day and took in my dress. I did it, the one last thing that seemed unconquerable after our struggles was the weight. And now the IVF weight was finally gone. The wedding came and I felt great. I had energy, fit in my dress and best of all, I was able to see my dear friend, Ann, have her dream come true. She married her true love. She held on to the happily ever after, and got it. Ann and Jordi put an amazing amount of thought into their wedding, and the events surrounding it. They made all of their guests feel welcome, appreciated and special. We soaked it up. I put on my dress the day of the wedding and momentarily thought about how I was expecting to be a little over 5 months pregnant at their wedding. And, I told myself I was OK, and I truly meant it. When I was handed my cute little tin that represented fertility for Ann and Jordi, I said extra prayers. I listened to the vows that Ann and Jordi wrote and tears filled my eyes. I felt so blessed to be able to stand up for them and support them in their commitment. And, I felt so blessed to see my husband looking over at me during the wedding...I know he was thinking just what I was--that Ann and Jordi have an amazing love for each other just like we do. Jamie and I had an amazing trip, we met so many wonderful people--family and friends of Ann and Jordi--were able to "recharge our batteries" and revisit the good we have in life. It's so good to feel like me again. Thank you, Ann and Jordi! OMG Heather!!! You have us both in tears. We are so touched by how honest and willing you are to share all that you have shared. We are so honored to be a part of the process that you just went through and were honored to have you and Jamie (Jordi's favorite new friend) so deeply involved in our dream wedding weekend. Heather, your energy and joy brought so much happiness to everyone around you. Seeing you so beautiful, smiling and glowing, having so much fun with us and our friends, brought immense joy to our hearts. And Jamie, you were a favorite to everyone who told us they had met you, as well as one of ours. The wedding would not have been so beautiful, memorable and special without your presence, excitement, and your love. The two of you truly represent what we strive to become as a married couple. We love you both and little Griffin with all our hearts and consider your friendship among our greatest blessings. We cannot wait to create more wonderful memories together with you and share many more celebrations for all the good that is yet to come in our lives. Thank you for sharing your heartfelt, beautiful, optimistic, and meaningful story with us. It is truly a honor.